The programme notes that often accompany The Girl Chewing Gum today are composed of quotations from critics and academics; for instance, the film scholar Ian Christie’s assertion that ‘John Smith’s improbable treatise on representation has deservedly become a Co-op classic’ is frequently invoked.4 The text originally used for this purpose was written by Smith himself and has not appeared in connection with any recent presentation of the film (fig.2).5 In it, Smith describes the programme’s other films in formal terms, but takes up a different strategy for his then-newest work, which appeared last on the bill. Here, one finds the filmmaker’s dry humour on full display, alongside what is perhaps a reluctance to give away the film’s conceit in advance: ‘I am writing this with a black “Tempo” fibre-tip pen. A few months ago, I bought fifteen of these pens for sixty pence. I bought the pens from a market in Kingsland Road in Hackney, about a hundred yards from where the film was shot’.6 At first this story of the pens seems to be utterly unremarkable and rather beside the point. After all, what purpose does it serve other than to geographically locate the shooting location of the film? Closer examination, however, reveals that what initially appears to be irrelevant actually provides the attentive reader with a subtle clue as to the film’s concerns. The words ‘I am writing this with a black “Tempo” fibre-tip pen’ are not in fact handwritten, but typed. Smith plays with the slippery relationship that exists between sign and referent, between the deictic shifter ‘this’ and the thing in the world to which that word might point. The indexical operation of designation is called into question, as the ‘this’ of the statement (written in fibre-tip pen) and the ‘this’ presented to the reader (a typewritten text) do not coincide. A gap opens between them, the very same absence at the heart of representation itself that The Girl Chewing Gum astutely interrogates. In the mid-1970s, the London Film-makers’ Co-operative was a space of vibrant dialogue concerning the political efficacy of avant-garde filmmaking. 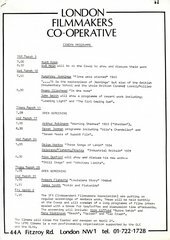 On 10 and 11 February 1976, exactly one month before the first screening of The Girl Chewing Gum, the Co-op hosted a two-day seminar called ‘Theory of Avant-Garde Film Practice’. Based on the November 1975 special issue of Studio International devoted to British and European experimental filmmaking, the event saw filmmaker-theorists Peter Gidal, Malcolm Le Grice and Peter Wollen each present papers, show films and participate in a chaired discussion. The Studio International issue up for debate featured two influential texts exemplary of the ethos that prevailed at the Co-op during this period: Gidal’s ‘Theory and Definition of Structural/Materialist Film’ and Wollen’s ‘The Two Avant-Gardes’. Taken together, they are immensely helpful in reconstituting something of the original production and reception contexts for The Girl Chewing Gum. Wollen’s ‘The Two Avant-Gardes’ offered a rather different position, particularly on the issue of narrative. Wollen divided experimental practice in Europe into two camps: those aligned with the Co-op and pursuing the kinds of strategies Gidal elaborates, and those like Jean-Luc Godard and Jean-Pierre Gorin, and Jean-Marie Straub and Danièle Huillet, who made Brechtian film essays. For Wollen, the filmmakers of the Co-op constituted a painterly avant-garde interested in the expulsion of language and narrative, and invested in a search for cinematic specificity that he saw as ‘deceptively purist and reductive’.9 Gidal and Wollen both described the contemporaneous field of practice as one in which dominant cinema was the object of an assault to be accomplished by intense work on the signifier. The point of contention between them lay in whether this would be most successful through the evacuation of content proper to structural/materialist film or whether it might be, in Wollen’s words, ‘possible to work within the space opened up by the disjunction and dislocation of signifier and signified’.10 This would mean not jettisoning content (the ‘signified’) entirely, but retaining it while insistently putting into question its relation to form (the ‘signifier’). For Wollen, language and narrative were sites of intervention too important to be cast out of the purview of avant-garde filmmaking. For all these departures from the structural/materialist line, The Girl Chewing Gum is not any more at home within Wollen’s ‘second’, essayistic avant-garde. Smith does share with the Godard-Straub axis a strong interest in semiotics and the conviction that, as the literary and cultural theorist Roland Barthes had suggested in 1970, ‘The contemporary problem is not to destroy the narrative but to subvert it’.14 The Girl Chewing Gum never rejects the codes of dominant cinema entirely, but rather playfully entertains them so as to render their operations and occlusions visible. Language is tremendously important. However, the film departs sharply from the institutional and economic contexts of the second avant-garde in that it was made within an artisanal mode of production and depended on the Co-op for its distribution and exhibition. Even at the level of the text, it lacks the disjunctive montage employed by many of the filmmakers Wollen discusses, as well as their palimpsestic intertextuality. In its isolation of a single filmic device – in this case, the function of the voiceover – it is in a closer relation with the kind of reductive forms of structural/materialist film. If anything, The Girl Chewing Gum might be seen to have most in common with American films of the period such as Michael Snow’s Wavelength 1967 and A Casing Shelved 1970, or Hollis Frampton’s Zorns Lemma 1970 and (nostalgia) 1971, which engage with narrative and language-image relationships while reflecting on the specificity of cinematic representation. Indeed, looking back on the period surrounding 1975 in his 1997 PhD thesis, the first three filmmakers Smith lists as inspirational to him at this time are Snow, Frampton and the Austrian Peter Kubelka.15 Although Smith has never seen A Casing Shelved and did not see (nostalgia) until after making The Girl Chewing Gum,16 both films show an especially close kinship with his work in that they make use of a voiceover delivered by or as the filmmaker to describe the image, only to then emphasise the lack of fit between the two. They present themselves as failed attempts to master the visual field. In A Casing Shelved, Snow describes in great detail a 35 mm slide of a shelf in his studio. As he put it, ‘I wanted to say everything that could be said about it’.17 Yet despite this stated desire for a complete account, Snow is incapable of exhausting the photograph or taking inventory of its contents in a stable manner. His description of the slide oscillates between naming the things depicted in it – a wine bottle, a paint can – and naming its forms of graphic representation. An electric cord, for instance, is called ‘a black line’, while a cardboard box is a ‘brown rectangle’. Contaminating these two registers of denomination, Snow shuttles between the virtuality of the represented scene and the material actuality of the photograph. In (nostalgia), Snow reads a text written by Frampton in the first person, describing a series of photographs taken by the latter which appear one at a time onscreen, burning on a hotplate. But instead of creating a tight suture between text and image, the description heard corresponds not to the photograph onscreen but to the photograph that will follow it. A gap opens between what is said and what is seen, just as it does in The Girl Chewing Gum. Beyond the similarities in formal technique and semiotic inquiry, The Girl Chewing Gum shares with these two films a quality not often associated with avant-garde cinema: humour. A Casing Shelved and (nostalgia) showcase the dry wit of their makers, both mobilising Snow’s droll Upper Canadian monotone to deliver a cerebral amusement that stops just short of being properly funny. While The Girl Chewing Gum is wry as well, it is worth noting its differences in tone and sensibility from its American counterparts. Ian Christie has suggested that Smith’s particular brand of humour might best be seen in the lineage of ‘English eccentricity’, a particularly national tradition that he sees as marked by a quirky preoccupation with the ‘unfashionably local’, a fascination for ‘the mundane’ and an interest in techniques of defamiliarisation that would ‘show the illogic of the usual’.18 While such characteristics might also be said to be present in the American films as well, A Casing Shelved and (nostalgia) are marked by a dry flatness that recalls the affect of conceptual art and minimalism, found nowhere in The Girl Chewing Gum. For Christie, Smith is an inheritor of the sensibility of the English writer G.K. Chesterton, like him using ‘the everyday topography of London as a foil for the cosmic struggle between anarchy and order, which is supposedly taking place beneath and above its streets’.19 Both Frampton and Snow include autobiographical elements, but the world of their films is very distinctly the art world rather than the quotidian life of their neighbourhood or city. The voice of (nostalgia) is emphatically a reading voice, possessing none of Smith’s responsive, exuberant flamboyance and never reaching the levels of absurdism and, by extension, entertainment that one finds in his film. The Girl Chewing Gum, then, shows certain connections to contemporaneous American tendencies while remaining distinctively English. It is a unique film that is ultimately inassimilable to the categories that were commonly used to describe the prevailing tendencies in avant-garde practice in Britain at the time of its production. In this it is not alone; the paradigms outlined in texts such as ‘Theory and Definition of Structural/Materialist Film’ and ‘The Two Avant-Gardes’ are always more uniform and rigid than the diverse field of activity they seek to chart. Nonetheless, rehearsing the film’s points of contact and lack of fit with such categories remains a useful exercise, for it enables one to situate The Girl Chewing Gum within the broader field of discourses and practices from which it emerged and in which it was first encountered. 1. Malcolm Le Grice, untitled film listing, Time Out, 5–11 March 1976, p.64. In addition to the five films Le Grice mentions, the programme also featured Words 1972–3, made with Lis Rhodes, and Nine Short Stories 1975. 2. John Smith, interview with the author, 16 June 2014. 3. Cornelia Parker, ‘John Smith’s Body’, in Mark Cosgrove and Josephine Lanyon (eds. ), John Smith: Film and Video Works, 1972–2002, Bristol 2002, p.8. 4. See, for example, www.lux.org.uk/collection/works/the-girl-chewing-gum, accessed 11 June 2015, and http://johnsmithfilms.com/selected-works/the-girl-chewing-gum, accessed 11 June 2015. 5. A longer version of the original text was included in a 1982 pamphlet entitled ‘John Smith Films 1975–82’ (available in the John Smith file at the British Artists’ Film and Video Study Collection), but it does not appear to have been used since. 6. 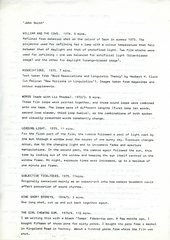 Programme notes of the London Film-makers’ Co-operative, 10 March 1976, 1p, courtesy of British Artists’ Film and Video Study Collection. 7. P. Adams Sitney, Visionary Film: The American Avant-Garde, 1973–2000, 3rd edn, New York 2002, p.348. 8. Although Gidal allowed that such exercises ‘are not irrelevant as sociological insight into certain filmic operations’, he saw them as ultimately reproducing through filmmaking a practice better suited to writing, a fact that he saw as having ‘now dawned, perhaps, on the overzealous graduates who wish to make statements about certain usages of narrative’. Peter Gidal, ‘Theory and Definition of Structural/Materialist Film’, Studio International, vol.190, no.978, November–December 1975, p.190. 9. Peter Wollen, ‘The Two Avant-Gardes’, in Philip Simpson, Andrew Utterson and K.J. Shepherdson (eds. ), Film Theory: Critical Concepts in Media and Cultural Studies, London 2004, p.135. 11. John Smith, ‘Real Fiction’, paper submitted in partial fulfilment of the requirements for Smith’s PhD, University of East London, December 1997, pp.3–4. Courtesy of British Artists’ Film and Video Study Collection. 13. Ibid. Yet it is worth noting that Gidal was a supporter of the film: after it was rejected by the Edinburgh Film Festival, he wrote to Linda Myles, the festival director, to argue for its inclusion on her programme. John Smith, interview with the author, 8 December 2014. 14. Roland Barthes, ‘The Third Meaning’, in Image Music Text, trans. by Stephen Heath, New York 1977, p.64, emphasis in text. Gidal was very clear in his opposition to this position in his 1979 text ‘The Anti-Narrative’: ‘What is not needed is “a different narrative”, “at the limit of fictions of unity” (Stephen Heath), “an enigma, contradictory”: The notion of “the limit” is both a Barthesian and Metzian notion, one which in fact refuses the necessity of denial’. See Peter Gidal, ‘The Anti-Narrative’, Screen, vol.20, no.2, 1979, p.78. 16. Smith recalls that the first films he saw by Snow and Frampton were (known as Back and Forth) of 1969 and Zorns Lemma, respectively. Although he saw these films around the same time he made The Girl Chewing Gum, he does not recall whether it was before or after, but notes that ‘both made a big impression on [him]’. John Smith, email correspondence with the author, 3 April 2015. 17. Michael Snow quoted in ‘The Camera and the Spectator: Michael Snow in Discussion with John Du Cane’, in Michael Snow and Louise Dompierre, The Michael Snow Project: The Collected Writings of Michael Snow, Waterloo 1994, p.91. 18. Ian Christie, ‘English Eccentric’, in Tanya Leighton and Kathrin Meyer (eds. ), John Smith, Milan and Berlin 2013, pp.49–50. Erika Balsom, ‘A ‘New Face’ at the Co-op’, in Erika Balsom (ed. ), In Focus: The Girl Chewing Gum 1976 by John Smith, Tate Research Publication, 2015, https://www.tate.org.uk/research/publications/in-focus/the-girl-chewing-gum-john-smith/a-new-face-at-the-co-op, accessed 25 April 2019.